Mrs. Norris is the ultimate “this is what you should do” person – she’s full of suggestions and ideas for things that will certainly better everyone’s lives, yet she never manages to actually DO anything herself. Her idea is that the family (and by family, she means everyone there except herself) should really work to help her sister and her children. Even though bringing Fanny in is her idea, she refuses to do anything directly to help her. Sir Thomas is continually surprised by Mrs. Norris’s refusal to be involved in any way with the niece whose adoption she had all but demanded. It is undeniable that Mrs. Norris is a busy body, not necessarily malicious, but certainly capable of throwing a kink into the otherwise peaceable and satisfactory lives of those around her. She could do my mother proud in her passive aggressive in her dealings with everyone. For example, when Sir Thomas and Lady Bertram begin to move forward on their assumption that Fanny will go live with Mrs. Norris after the death of Rev. Norris, Mrs. Norris goes to extreme lengths to assure that her state of being “a poor desolate widow, deprived of the best of husbands” whose” health [is] gone in attending and nursing him” would mean sending Fanny to her would be an “unjust thing” for the “poor girl.” There is no doubt in my mind that Fanny being forced to live with Mrs. Norris would have certainly been detrimental to Fanny, but not for the reasons that Mrs. Norris puts forward. Mrs. Norris is calculating , selfish, and envious. She all but takes Mrs. Bertram’s place in the household while Sir Thomas is there, and then when he is forced to Antigua, Mrs. Norris moves right into his place as “ringmaster” of the household. Now, don’t misunderstand me, she can’t do it all, so she depends on Edmund to take up the slack and do the icky things like “taking to the steward, writing to the attorney, [and] settling with the servants”, but make no mistake, Mrs. Norris sees herself as in charge of the family and their management. There is no better example of this than her “indulging in very dreadful fears” that Sir Thomas and Tom had not arrived safely in Antigua and trying to pull Edmund in with her. She assumed that she would be the first to hear the devastating news of Sir Thomas and Tom’s demise, so she got busy and “arranged the manner of breaking it all to the others.” She was all ready to swoop in to comfort the family, who would obviously have been lost without her to guide them during through that devastating loss (for she would have fain denied herself the luxury of grief for their deaths as she would be busy saving the rest of the family from certain destruction). 😉 However, news of their safe arrival disappointed her plans and rendered her “affectionate preparatory speeches” dormant for a while. Even though Sir Thomas’s safety had thwarted her role as protector and savior, she is so devoted to her role as Sir Thomas’s replacement that she sets about trying to procure her nieces (her Bertram nieces) their future husbands. She seems completely devoted as a “caretaker” for her Bertram nieces, girls who don’t need her assistance as they are completely capable of “catching” a man on their own. Ironically, Fanny, who really does need someone in her corner, is completely off of Mrs. Norris’s radar as worthy of her help. Mrs. Norris seems desperate to be needed, but she refuses to be useful to the one person in the house for whom she could do the most good. Her busybody, misguided meddling seems endless, so much so that I cannot avoid a very obvious parallel in modern literature. 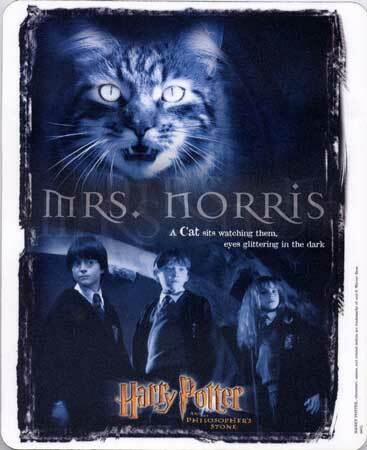 While I haven’t read or heard any evidence of the truth of the following theory, I must admit that I unequivocally believe that the Mrs. Norris from Mansfield Park is the inspiration for none other than Mr. Filch’s Mrs. Norris in the Harry Potter series. There are some striking similarities – both seem to always be in someone else’s business (lurking in the background no less), but neither one is actually capable to DOING anything themselves. They rely on others to carry out their machinations and thwart the plans of their victims. That’s so like a cat… only useful on its own terms and according to its own agendas. The cat comparison is hilarious and so appropriate. Mrs. Norris is the ultimate grumpy cat and busybody. At least Rowling got some inspiration from Mansfield Park.